MATERIAL - Zinc Metal Alloy + polyester + iron plating = waxed cotton. Great and fabulous faux leather suede quality and does not kink, Smells nice and pretty sturdy, Nice and soft. Perfect for the charms ! DIY JEWELRY HANDING MAKING- Perfect for necklace jewelry hand-making or for personal use to put pendants, charms or other jewelry findings on or to even wear just plain or holders for keys, usb sticks, or the unique pendant. Works perfectly with all charms within opening than 2.5mm. Great for Art Camps and making some custom jewelry with pendents of your choice or revamp some jewelry! Especially it would be a great assist to crafts for little girls. MAINTENANCE and NOTICE - not recommended to use it for shower, it is better not to wet it. This is not for wrist or bracelet, just for pendant necklace or wear plain. Good for bottle cap necklaces and you are able to put the bottle cap charms on with ease. If you want to take off one of the ends to put the charms on, then you should find proper tools, but it would be very time consuming. 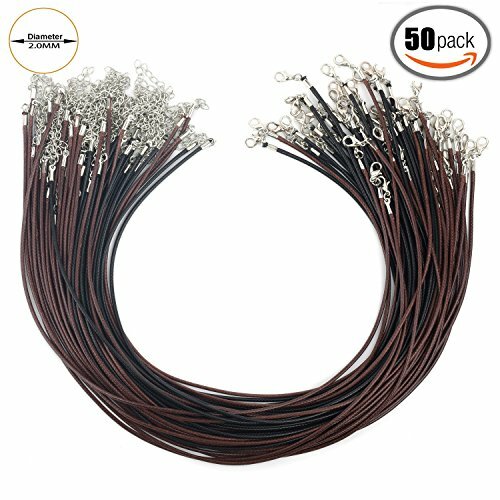 CONTENT - 25pcs black and 25pcs brown, bundles of 50pcs cord. COLOR and SIZE - 25pcs in black and 25pcs in brown, bundle of 50pcs. A little longer than a choker.The clasp is a \"lobster claw\" style. The \"claw\" part that opens is about 8mm long and about 14mm at its widest point.Cord diameter: 2mm.Cord length: 18 inches. Lobster claw length: 5inches. The lobster claw clasps are strong enough to hold up to typical wear. Extension chain length: 2inches. They are long and can be adjusted by the clasp and chain. Lightweight,flexible,durable,strong and well made. Great Set of Necklace Cords for a Great Price!